The Bizzare Adventures of Woodruff and the Shnibble (known as The Woodruff and the Shnibble of Azimuth in Europe) is a puzzle adventure game by Pierre Gilhodes, the creator of the Gobliiins series. It shares the same art style, humor, and gameplay as the Gobliiins series, but it is not a part of it. After an atomic war where humans have retreated underground and mutants have formed. The humans use the mutants as slaves, and Professor Azimuth wants to bring peace to the two species by creating a mythical being called a Shnibble that is said to bring peace. 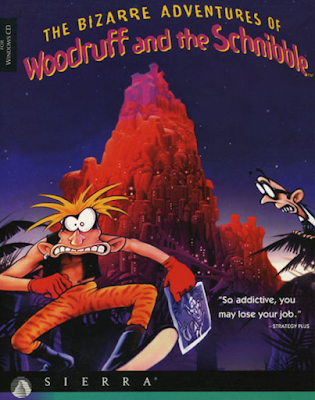 The Bizzare Adventures of Woodruff and the Shnibble is now supported by ScummVM, a program designed to let 2D adventure games run on multiple platforms. With ScummVM, The Bizzare Adventures of Woodruff and the Shnibble now runs on modern versions of windows, as well as Linux, Mac OS X, and many consoles such as Dreamcast, Wii, PlayStation 2, and PlayStation Portable. For a complete list of platforms supported by ScummVM, see here.